Certified biodegradable cleaner, free of allergens. Human and environment friendly, per the European directive EC 648/2004. The specific directive governs the composition of detergents with respect to their biodegradability. It does not irritate hands and it does not cause any inhalation related problems. 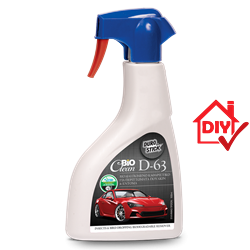 Dissolves with a spray, stuck bird droppings, without affecting the paint and colors of automobiles. It also removes insects stuck to the windshield, the lights, the mask and the bumper of automobiles. Suitable to clean metal and wood railings as well as the marble saddles underneath. Use it to clean surfaces immediately and protect them from damage created by bird droppings.